An amateur video of a California road-rage incident was posted on Facebook on Wednesday. It has since been viewed more than 1.4 million times. Road rage is not a good look, whether it happens in Philadelphia or elsewhere. On this, I think we can all agree. 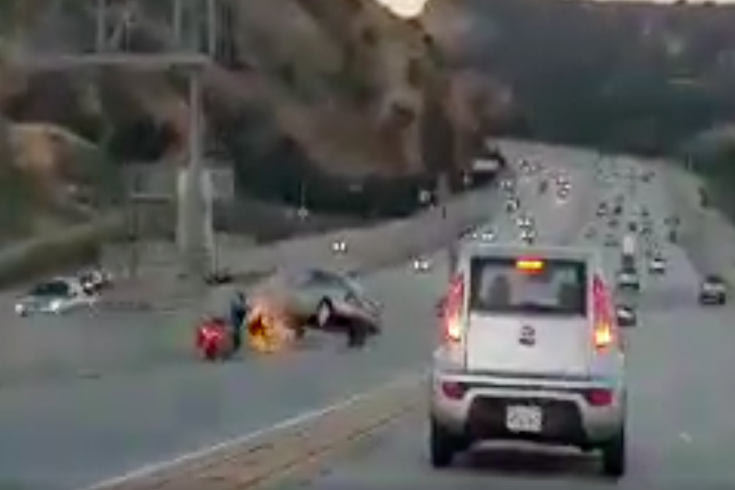 Bringing that dynamic into focus is a video – shot by a fellow motorist – on a highway near Santa Clarita, California, early Wednesday morning. It involves a motorcyclist kicking the side of sedan, that sedan then crashing into the concrete divider before veering into a passing pickup truck which then flipped onto its roof. From there, the motorcyclist totally takes off from the scene in the carpool lane. Despite the dramatic images, neither driver was seriously injured in what California Highway Patrol Officer Josh Greengard said “could’ve been a horrible tragedy. More people could’ve gotten hurt," according to the Los Angeles Times. The incident, which you can see in the videos below, happened at 5:45 a.m. Wednesday. It also left the CHP trying to track down the motorcyclist, who had not been caught as of Friday morning.